Erin Rigelman of the Bluecoats sent this picture of the University of Michigan snare line. 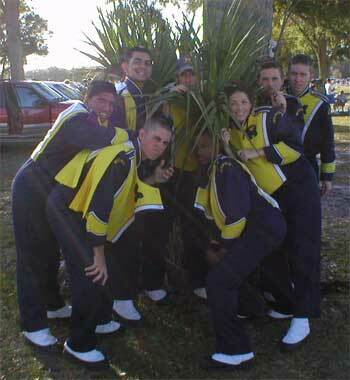 "This picture is of the 2002 University of Michigan snare line after the Outback Bowl game last winter. Starting in the back-middle and going counter-clockwise, the members are: Mark, Nick, Alvin, Brennan, Andre, me, Evan and James. Brennan marched with the Glassmen and Magic of Orlando, and Evan and I marched with the Bluecoats. I marched with the Bluecoats from 2001 to the present, and Evan marched there from 2002-2003." Thanks Erin! If you marched in a DCI corps in 2003 and now you're in a college or a high school marching band, we want to hear from you! Send us a picture (dave@dci.org) of you and your buds, along with some other anecdotal information about your marching experiences, and we'll post it on DCI.org!